Summon: Summon a creature from your discard pile with less power than Odirniran Necromancer. Odirniran Necromancer is a legendary Endurance creature card. It is part of the Houses of Morrowind expansion. This card is named after the Velothi tower Odirniran, which first appeared in Morrowind and later appeared in ESO as Barilzar's Tower. 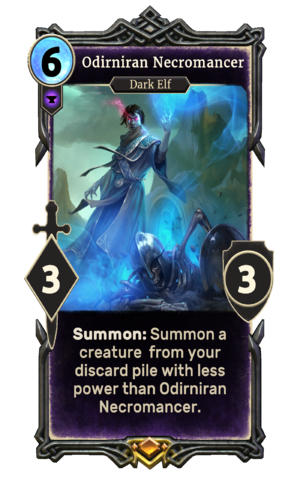 The card likely depicts Milyn Faram, a House Telvanni necromancer who resided there in Morrowind. This page was last modified on 2 March 2019, at 00:36.